Welcome to our Tres Jolie April 2019 reveal. Today we are revealing our all our April kits. Once again, I’m just as excited to bring you these kits. At Tres Jolie we do our best to bring you the latest and greatest. This month is no exception. Our main kit is filled with brand new papers from 49 & Market. This was created for our monthly challenge (see below). Visit our designers blogs for their monthly challenge inspiration project. Tres Jolie will host a different challenge each month. This month We have a sketch. This sketch can easily be used to create a card, tag, layout or even altered project. This challenge is open to everyone, however we would like to see what you do with our kit(s) and our sketch. Place your entries in the April 2019 Challenge folder on Tres Jolie Kit Club Cafe Facebook page. All are welcome to enter, however we’d love to see what you do with our kits. This challenge ends on April 30th, 2018 at 11:59 pm CST. Remember to stay tuned to the blog all month long for more inspiration using the April kits. If you want to see more details of any of these projects, look back through the previous posts on our blog! Did you get a kit? Share what you made in our Facebook Group! Welcome to our Tres Jolie March 2019 reveal. Today we are revealing our all our March kits. Once again, I’m just as excited to bring you these kits. At Tres Jolie we do our best to bring you the latest and greatest. This month is no exception. Our main kit is filled with papers from Prima Marketing and brand new Mintay. Tres Jolie will host a different challenge each month. This month We have a mood board. This is mood board can easily be used to create a card, tag, layout or even altered project. This challenge is open to everyone, however we would like to see what you do with our kit(s) and our mood board. Place your entries in the March 2019 Challenge folder on Tres Jolie Kit Club Cafe Facebook page. All are welcome to enter, however we’d love to see what you do with our kits. This challenge ends on March 31st, 2018 at 11:59 pm CST. Remember to stay tuned to the blog all month long for more inspiration using the March kits. 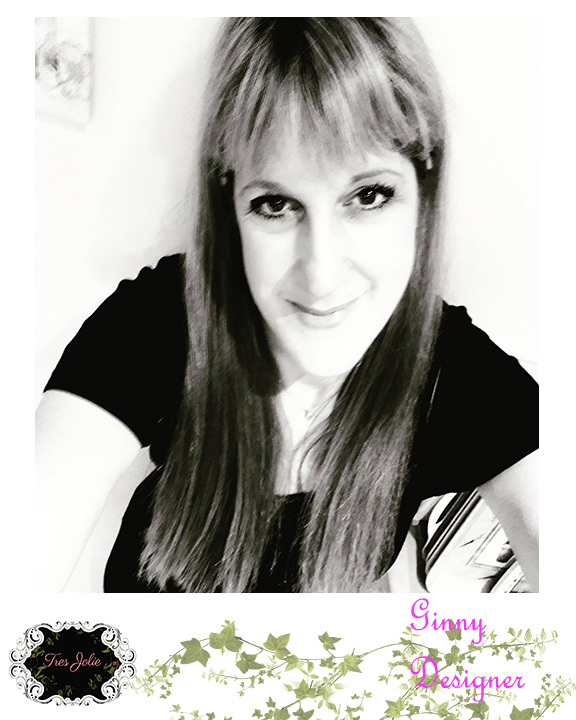 Today I’m back with a layout created with the January Scrapbook kit from Tres Jolie Kits. This kit is so pretty, it is definitely one of my favourites! The papers from Prima Marketing and 49& Market are stunning and as for the flowers….. so pretty…. I hope you are all enjoying creating with it! For this layout I have gone back to the 49& Market papers. I adore the colour tones in these papers. I used three of the Sweet Reflections papers for this layout, distressing the edges and layering them up, all slightly different sizes. I added some background stencilling with a stencil and texture paste. These flowers are GORGEOUS! If you only buy one of the flower sets from the Prima Lavender Frost collection it has got to be this set – Misty Nights. I did fussy cut some flowers from the Awakening paper and add to my flower cluster at the bottom of the layout. I added a beautiful piece of lace from my stash to add a soft pretty romantic touch to the layout. I did use some flowers from the other packs of flowers in the kit too to ‘fill’ in. I dabbed around the outer edges of the 2 background papers with the chalk ink pad. Happy New Year to you all, I hope you have all have a fabulous, happy, healthy, peaceful and joyous 2019! 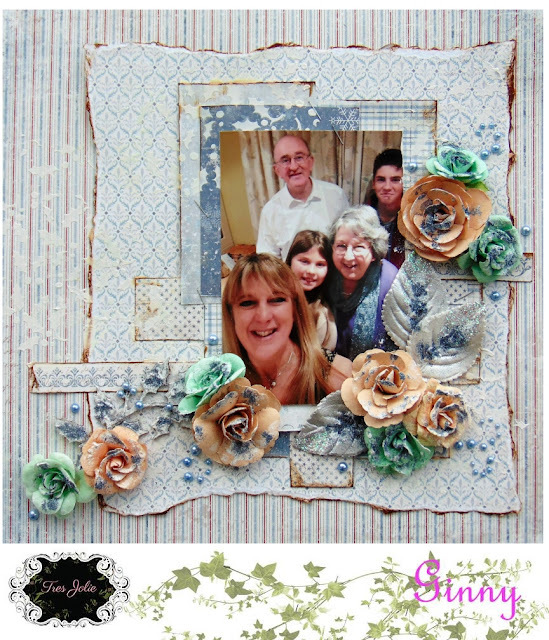 It’s time for a layout created with the January Kit from Tres Jolie Kits, this kit is a beauty this month! We have beautiful papers from 49 & Market and Prima Marketing and some gorgeous embellishments to compliment them. I have also had the pleasure of creating with the Cards Tags and More Kit this month too… again filled with Prima goodies. More on that later in the month. Today I have decided to share with you a layout created with the Prima Marketing Lavender Frost papers. I did a little stenciling with texture paste in the background. There are loads of layers in this layout, small oblongs cut from lots of the Prima papers in this collection. The flowers from this collection are stunning. I grouped them together along with some butterflies fussy cut from the papers. I added some of the tickets in the clusters too. All the flowers are packaged with a piece of printed vellum paper… I loved this and couldn’t waste it so I have used this in my paper layers. I added touches of Nuvo Crystal drops to the layout from a previous kit. Welcome to our Tres Jolie January 2019 reveal. We are excite to bring you our first kits of the New Year. Today we are revealing our all our January kits. Once again, I’m just as excited to bring you these kits. At Tres Jolie we do our best to bring you the latest and greatest. This month is no exception. Our main kit is filled with papers from Prima Marketing and 49 & Market. Tres Jolie will host a different challenge each month. This month We have a mood board. This is mood board can easily be used to create a card, tag, layout or even altered project. We want to see what you do with our kit(s) and our mood board. Place your entries in the January 2019 Challenge folder on Tres Jolie Kit Club Cafe Facebook page. All are welcome to enter, however we’d love to see what you do with our kits. This challenge ends on January 31st, 2018 at 11:59 pm CST. Remember to stay tuned to the blog all month long for more inspiration using the January kits. Welcome to my last post for the month featuring the December Kit for TRES JOLIE KITS. Today I’m sharing with you a scrapbook layout created with the gorgeous Maja Design Joyous Winterdays paper collection. Lets show you some close ups and details of the layout…. I used lots of layers in this layout, using all the lovely patterns and designs in this paper collection. I inked edges with vintage photo distress ink. I used the stencil from the Mixed Media Kit, to add some holly texture paste detail to the background paper. I also used the Art Sugar from the Mixed Media kit and dropped it into glue on top of all the flowers and leaves to add a real wintery feel to the embellishments. The Kaiser pearls in Denim I added in swirls coming from the flower clusters and the odd single one dotted around. I love this photo from a recent visit with my parents to celebrate their 50th wedding anniversary! I had a piece of the Holly and Berry border left over from another layout, so I used it on this layout. I covered it with SnowTex from my stash, to give it a snowy look about it and then again dropped some Art Sugar into it. Hey everyone Kim here, I had a regular post scheduled for today. Instead, I’m going to spread some Holiday cheer by announcing the winner of our November Mood Board Challenge. Congratulations to our winner: Donna Bailey Sergent. It was a hands down favorite with the judges. We love the way she used texture, especially on the feathers. The overall design is just gorgeous. Great job Donna. Make sure you join us in our monthly challenges. They are open to all, not just subscribers. Join us for the rest of the month as the designers reveal their final projects created with all our amazing December kits. We still have kit subscriptions available here. You can also just try out a single kit here. Tres Jolie wishes you and your Family a Merry Christmas. 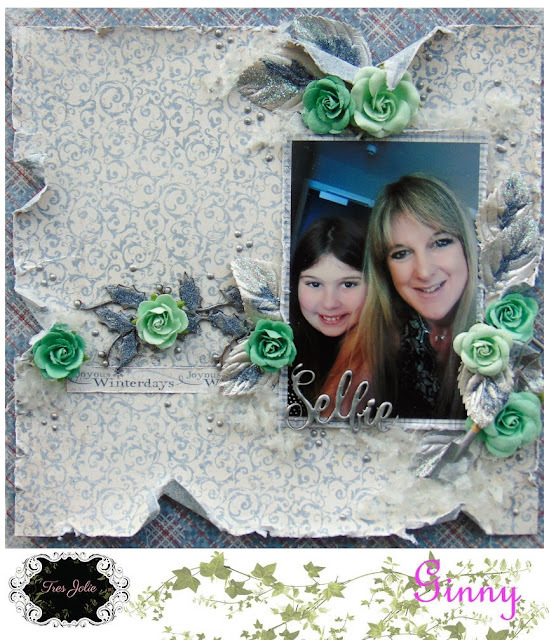 I’m back today with another layout to share with you all created with the December Scrapbook kit from TRES JOLIE KITS. 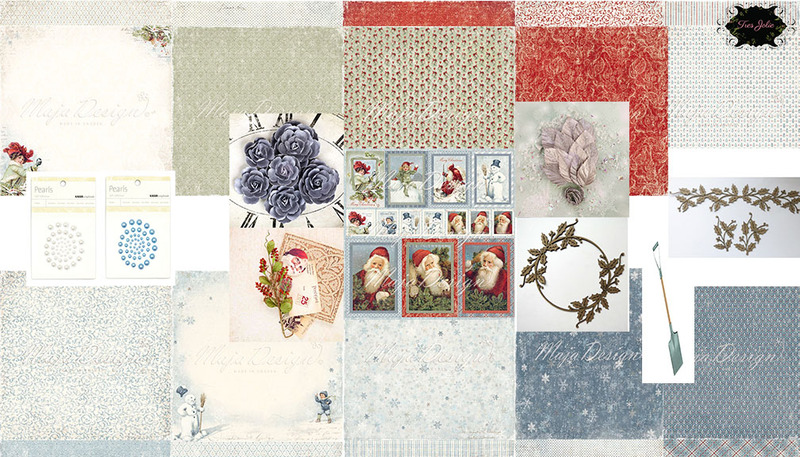 This time I chose to work with the brighter colours from the paper collection Joyous Winterdays from Maja Design. Now to share some details and close ups…. I tore a large triangular piece of co-ordinating paper, Christmas Time, to go with my chosen background paper, Make Decorations. I edged it with some Distress Ink. I used the paints from the Mixed Media Kit to paint the chipboard Holly & Berry Frame, which I cut into two pieces. The photo was backed on the Frost paper. 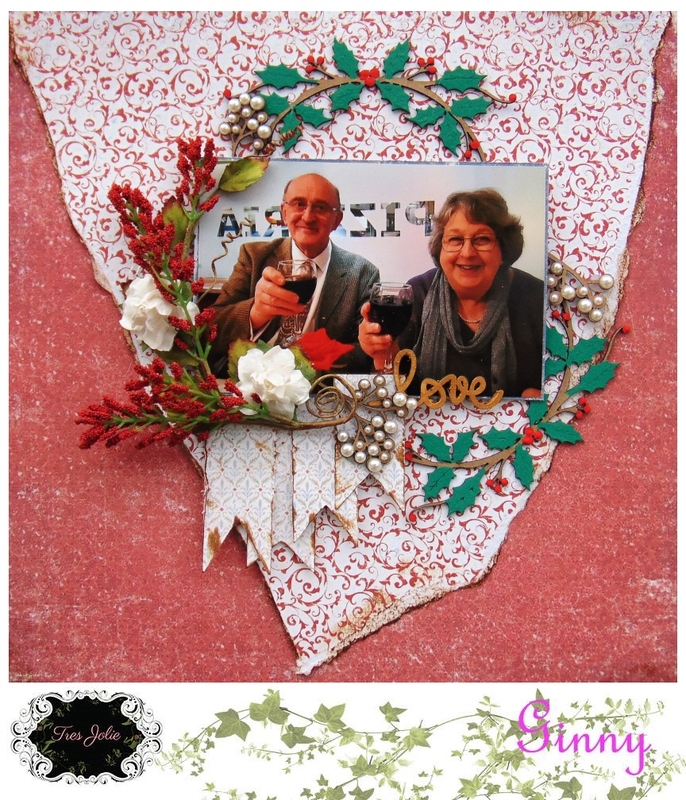 I used the Kaiser Pearls to add to some chipboard from my stash to create Mistletoe. The title chipboard I covered with Viva Inka Gold from my stash just by rubbing it over with my finger. The vine I shaped around the photo to carry on the circular design started with the chipboard frame. Welcome to another post featuring the December Scrapbook Kit from TRES JOLIE KITS. This kit features papers from Maja Design Joyous Winterdays collection, flowers from Prima Marketing and chipboards from Creative Embellishments. What is there not to love?! Here is my wintery themed layout with myself and my favourite girlie ! ❤ …. The next photos show you a few close ups with details of my work. The top background paper, Glisten, was heavily distressed round the edges and then backed onto the main background paper, Cozy Inside. The photo is backed onto paper Frost. I added the title strip from one of the papers as a border across the layout. The chipboard title was covered with Nuvo Cryatsl drops. I covered the chipboard with the silver Nuvo Crystal Drops and dropped the Antique Silver Art Sugar from the Mixed Media kit onto it whilst still wet. I added Nuvo drops all round the layout. I loved the cute shovel which I nestled in the flower cluster. I added the Art Sugar to some of the flowers and silver leaves too. I finished by adding some of the ‘snow’ from the mixed media kit to the shovel and the flower clusters.